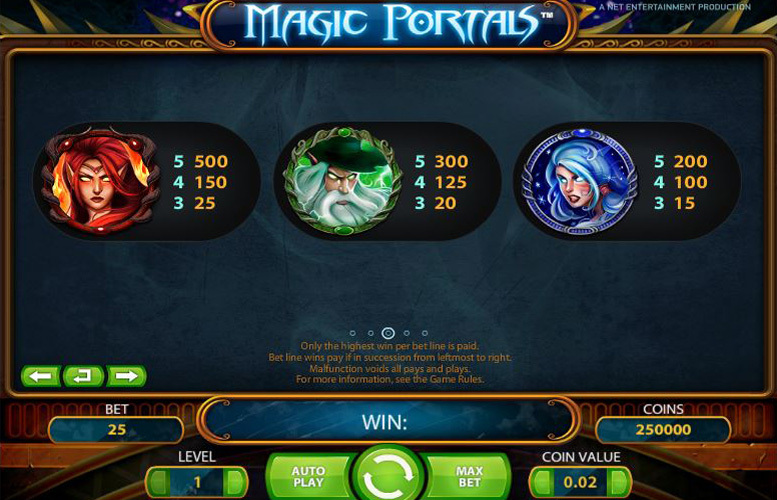 Magic Portals is a five reel and three row slot game themed around the mythical world of witches, warlocks, dragons and other fantastical beings. The slot features 25 pre-set paylines, has a theoretical return to player percentage of 96.6% and gets its name from the two ‘magic portals’ found on the reels, which turn symbols into Wilds and trigger free spins. 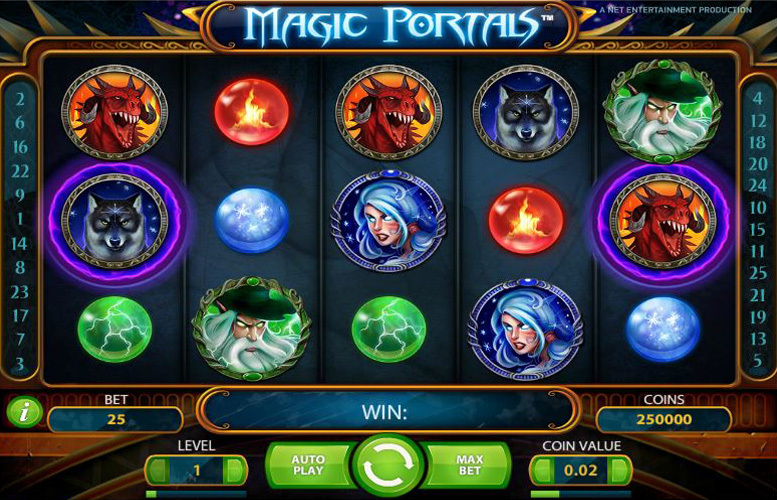 Taking the innovative route of linking its free spins and wilds to ‘magic portals’ on the reels, Magic Portals is an interesting and original slot. The below review will tell you all you could want to know about the game’s top jackpot, its special symbols and features, its paytable and the betting control offered to players. Aside from the ‘magic portals’ that give the game its name, this slot is a relatively straightforward one which pays out on matching symbol combinations of three or more from left to right along its 25 pre-set paylines. The most valuable symbol of the game is the red female elf symbol and five of those along a payline provide winnings worth 500 times the bet level. At the top bet level of ten, therefore, that combination can result in a payline jackpot of 5000 coins which can be worth £5000 at the top coin value of £1. Multiple winning paylines can be achieved from one spin but the game does set a jackpot limit of 64,000 coins. Potentially worth £64,000, however, that is still a comparatively generous top jackpot. 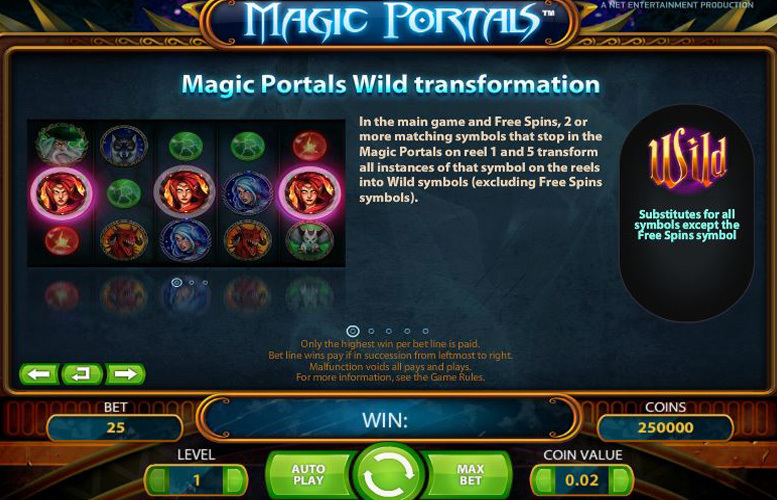 The only special symbols featured in the Magic Portals game are the Wild and the Free Spins symbols and each of these work in combination with the game’s ‘magic portals’. These portals are found on the middle row of reels 1 and 5 during both the main game and free spins. Wild Symbol – if matching symbols appear in both ‘magic portals’ after a spin, the portals transform all corresponding symbols on the reels into Wild symbols. Those Wilds substitute for all other symbols apart from the Free Spins symbol and always go towards making up the most valuable possible combination for any payline. Free Spin Symbol – the Free Spin symbol, meanwhile, only appears on reels 1 and 5, and in both the main game and during free spins themselves, if a Free spin symbol appears in both ‘magic portals’, ten free spins are activated. Those free spins are always played at the same bet level and coin value as the spin which triggered them and winnings from them are added to a player’s total winnings from that spin. The mythical world of wizards, dragons, witchcraft and other magical entities forms the main theme of the symbols within Magic Portals, and the most valuable symbol of all is the red female elf symbol. A winning combination of five of those symbols pays out a jackpot of 500 times the set bet level. If the highest bet level of ten is selected, therefore, that payline jackpot would be 5000 coins, which at the top coin value of £1 equates to £5000. The next most valuable combination – made up of five green wizard symbols – returns winnings equal to 300 times the bet level and as such could result in a win equalling 3000 coins. Players cannot de-activate any of the 25 Magic Portals paylines to decrease their stake amount per spin, but what they can do is control both the bet level and the coin value. Coin value sets how much each coin is worth for a spin and the bet level determines how many coins are bet per payline. There are seven coin value options from 1p to £1 and ten bet levels from 1-10. Setting the lowest of each, therefore, results in a total bet of 25p (one 1p coin per line) and setting the highest leads to a total bet of £250 (ten £1 coins per line). 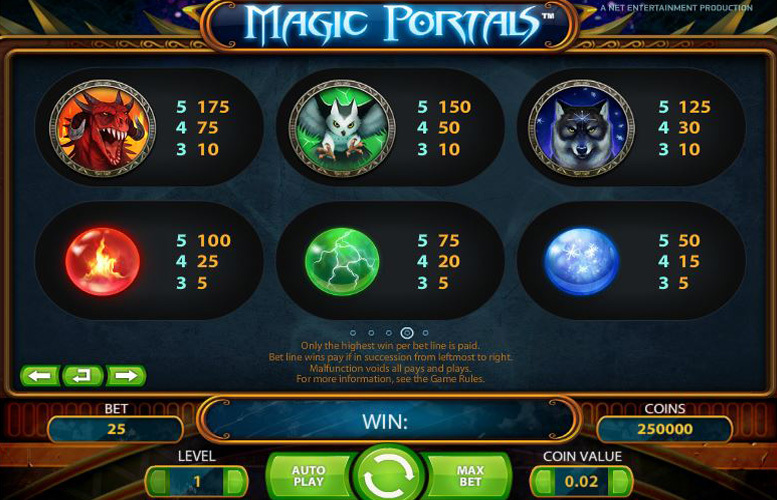 Magic Portals is one of a number of slot games which is deliberately designed to be visually attractive but simple in its gameplay. As such, players who want immersive and complicated bonus rounds or features are unlikely to be impressed. Those who want a fun and potentially rewarding slot that is easy to understand, however, will find that it ticks all of those boxes for them. Largely the game is a traditionally styled five reel slot, which makes it very quick to pick up for a new player and ensures that it is easy to grasp when and how winnings can be achieved. 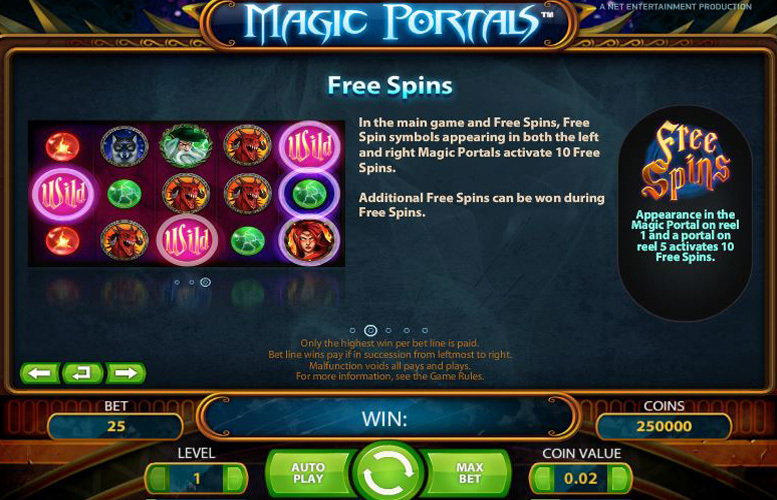 The ‘magic portals’ of the game, meanwhile, do add a little extra interest to the gameplay and can prove quite rewarding in terms of free spins winnings and Wilds substitutions. The highest possible payline jackpot of 5000 coins also compares well with similarly simple slot games but the overall cap of 64,000 coins as the highest possible win is perhaps a little on the low side. Overall, however, Magic Portals is a slot which anyone looking for a quick and interesting game, with an attractive theme and reasonable payouts is sure to enjoy.